One of the many letters Nininger received was one dated August 1931 from Saskatehewa, Canada. A meteorite was said to have been found in a field near the city of Springwater. This meteorite was of unique interest as only eleven others had been found in North America and none had been found in Canada. This meteorite weighed 41 pounds (20.6 kg) and looked like a full loaf of bread cut in half along with numerous broad shallow depressions in the meteorite. 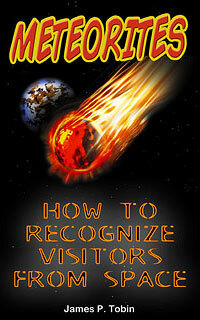 The meteorite also showed some places of oriented flight. Also shown were signs of it being broken from landing or possibly breakage during the last stages of flight. The matrix of the broken part resembled a fresh honey comb of yellowish olivine along with the jagged, irregular edge of metal that protruded from the specimen. The specimen revealed shinny metal where the owner had hammered it (for a sample) with the remaining metal a rusty brown dull color. 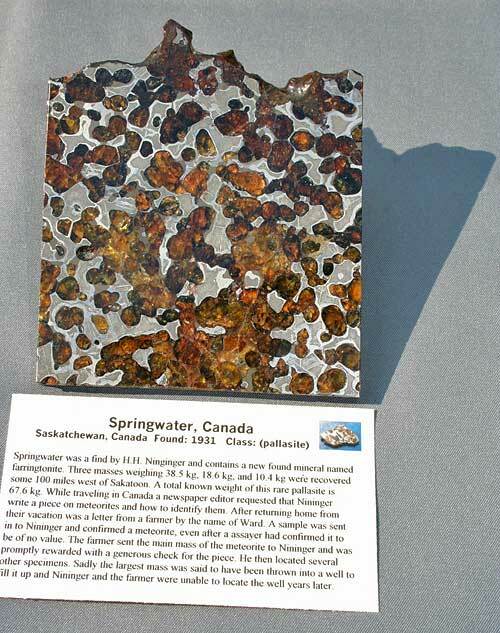 Nininger compared the Springwater Pallasite to the Brenham Pallasite and noted several observations. One was the outside could have been recognize as a Brenham piece, however the interior showed a finer matrix compared to the Brenham slices that Nininger had on hand. The crystals were about 1/3 that of the Brenham specimens. The metallic bands were also narrower. Nininger also noted that the olivine in the Springwater varied in brightness, from dingy to more transparent but in an irregular manor not associated with the outside weathering of the specimen. The metal in the Springwater Pallasite are about equal with the olivine and the metal doesn’t make up the larger portion of the meteorite. Etching pattern in Springwater is similar to the Brenham specimen but because of wider bands in Brenham they stand out more pronounced. 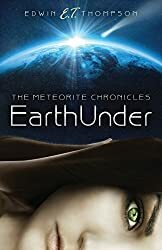 Nothing was known about the fall but Nininger noted that because the meteorite was not heavily weathered that the specimen probably couldn’t have been on the ground very long from the lack of scale and heavy oxide. Nininger noted that after the first initial mass was located, another two additional masses were located later on weighing 23 lbs and 85 lbs. Those pieces became a part of the Nininger Collection of Meteorites. One other mass that Nininger later investigated was said to be much larger then any of the mass so far recovered. That mass was said to have been thrown down a deep well. Nininger’s effort to recover this mass failed.